In the screenshot above, moving to the next modified line does nothing, since we are already at the very end of the document. Moving to the previous modified line first goes to line 4, then to line 2, and finally to line 1. By default, no shortcuts are assigned, so if you you want to use this, it makes a lot of sense to configure shortcuts. Modified and saved lines are treated equally, so maybe we should rather call it “touched” lines, since all lines that were touched by the user at some point in the edit history are taken into account. The rationale behind these two actions is to allow fast navigation in the text that you actually work on. Jumping over hundreds of untouched lines is quite handy. 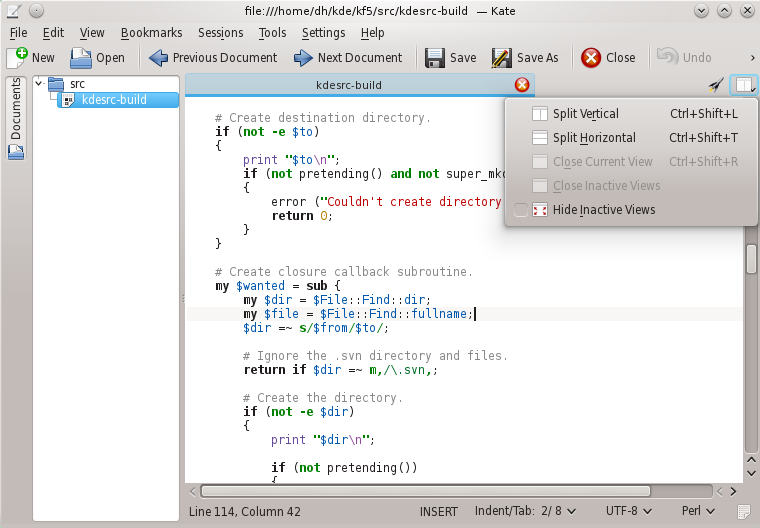 I am the original author of the Lumen KTextEditor plugin and I am happy to announce, I just committed it to the Kate repository for KDE 4.13! To make Lumen work you have to install DCD, unfortunately no Linux distribution has DCD packaged so far. Luckily the D community provides a remedy. For all Debian/apt based distributions like Ubuntu and Debian of course, there is the d-apt, simply follow the instructions on how to setup the apt-repository and install DCD via apt. For Archlinux exists an AUR Package. Everyone else has to setup DCD manually, but it’s really not hard, simply follow these instructions. After installing DCD edit ~/.config/dcd/dcd.conf (create if it does not exist already) and add a path to your D include/import files (phobos), for me this is /usr/include/dlang/dmd (on ArchLinux), for other installations this would most likely be /usr/include/d. Furthermore Lumen will try to read a .lumenconfig in every parent folder of the currently opened D source file and add every line in this file as include path to the DCD server. Add all dependencies of your current project to this file. Now start the completion server with dcd-server, enable the Lumen plugin in your settings and you will have code completion for the D programming language in your favorite editor! From 18th to 25th of January 2014, the Kate, KDevelop and Skanlite developers met in Barcelona to work on these projects full time for a week. Full time usually implies about 14 hours per person a day (yes, besides food, we do nothing but developing). 11 developers working 14 hours a day for 7 days makes a total of 1078 hours. If we divide this by 8 hours, the typical amount of work hours in a day, this makes 134 man-days of work, or about 27 weeks of continued development time. While this calculation is a bit theoretical, it is still very valid to estimate the amount of work that is put into these projects during such a sprint, especially since usually developers have far less time for development in their spare time. KTextEditor::Cursor and KTextEditor::Range are declared as Q_MOVABLE_TYPE, telling Qt containers that these primitive types can be mem-moved without copy constructor. 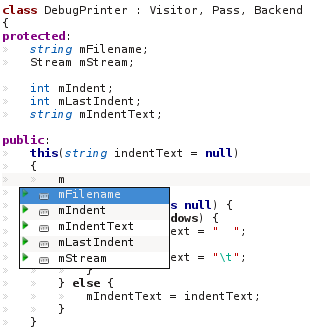 since KTextEditor and KatePart are now merged into a single list, the API was changed such that KTextEditor::Editor::instance() is a singleton. 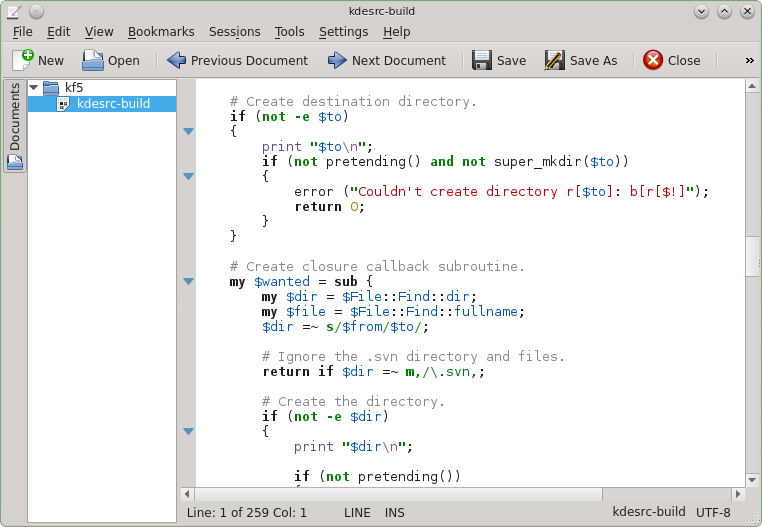 Therefore, KTextEditor::Document::editor() was dropped, as it is not needed anymore. 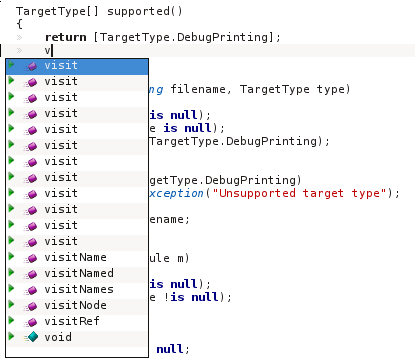 SQL plugin: start port, more porting, and more¸more, more, ....., done! New status bar: The status bar is in the KTextEditor interfaces now. That implies that KDevelop, Kile, and all other applications using the KTextEditor framework will have the same status bar. 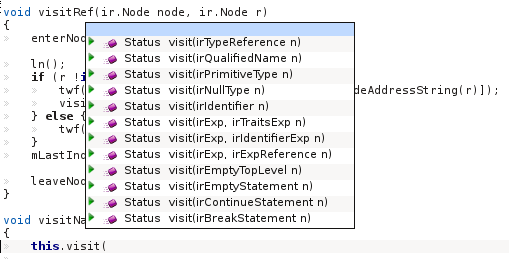 It is now possible to change the indent settings (tabs, spaces) through the status bar. The same holds for the encoding and the current highlighting. Double click on “Line: …, Column: …” switches into goto-mode (Ctrl+G). Double click on INSERT changes to OVERWRITE mode, if not in vi input mode. New Tab Bar in each view space: This tab bar shows the documents you are working on in a least recently used (LRU) fashion. It only shows as many tabs as fit into the tab bar, since we want to avoid horizonal scrolling (it does not scale). If not all documents fit into the tab bar, just use the Documents tab on the left, or the quick open icon in the view space tab bar bar on the right to to launch quick open. Since we now have a tab bar, we can now show the splitting actions at a more prominent place on the very right. New features include to hide inactive views, which equals maximizing the current view space. Yes, no worries, the tab bar can be disabled. We’ll cover the workflow of the tab bar in a separate blog post.